If John Henry is as serious about Liverpool being successful as we want him to be, he needs to be stark raving mad by now. During yesterday’s match, I was in the middle of a conversation with a friend who asked what happened to the Liverpool that ended last season (2010-11). You remember, the one admirably improved under the caretaking of Dalglish? The one that played quick, snappy passes, most of them on the ground, with relentless accuracy and finesse, producing fine wins like the 5-2 demolition against Fulham? I responded by suggesting the team was different – that team that ended the season well included a far more experienced and capable midfield of Maxi, Lucas and Meireles. Strange that. No question – the absence of Lucas is significant. It surprises me all the more that Liverpool managed to produce the performances they did in the Carling Cup against Manchester City, the FA Cup against Manchester United, and that league game against Arsenal, without him. His impact to this team can be likened to the manner in which Yaya Toure has become the rock upon which City’s title challenge has been constructed. Rather stupid then, that Liverpool didn’t recruit adequately to cover for him, especially in the January transfer window. Yet experience was on the bench – especially Maxi, who was integral in the victories over Chelsea earlier in the season. Liverpool instead chose to ignore this. In my opinion, Spearing and Henderson were out of their depth yesterday. Yes, Henderson showed attacking shades towards the end, but by then, Liverpool had been galvanised by Carroll’s energy and it’s clear that belief is not going to be inspired by Henderson, much less Spearing. I’m not keen to crucify either player though. Liverpool have been crying out for academy talent to come through, and I think Spearing is a capable squad player, who in other lesser important fixtures, can shine in his own way. Henderson is a victim of a transfer fee he didn’t choose, and being played beyond his years. They will learn and develop – but they shouldn’t be doing so at the cost of a cup final. And both certainly put up a major effort. I also don’t excuse the ineffectiveness of some of the experienced players, like Gerrard, who has been inconsistent, and Reina, who seems to have forgotten how to make those magnificent saves he is known for. Enrique has also become very inconsistent, making me think a fullback combination of Kelly and Johnson may have been better. But if Liverpool was poorly prepared and configured on the pitch, blame starts and ends where the entire season should – with the manager, Kenny Dalglish. My previous blog should clarify (and I re-iterate) that my feelings on Kenny are ones of deep respect and gratitude for the club. I wasn’t even born yet when Kenny was delivering trophies as a player for the club, but his efforts for the 96 alone justify enough for me to say he has deserved another shot at the job. And there is no doubt his influence made a difference in the latter half of last season. But this season, mistakes have been made aplenty, and sadly he may well pay for it with his job, especially if FSG illustrates the ruthlessness they did with Comolli and other staff last month. Yesterday’s tactics were inept. Playing Luis Suarez as a lone striker with ambitious through balls (high or low) may work to catch defences like those of Norwich off guard, and produce some great results, but they won’t work against a side in form that managed to survive 3 hours against the side who plays the finest football on the planet. If Lionel Messi can be kept quiet, with the quality service he’s used to delivering, you can bet that Suarez will be even less effective while chasing high balls against Ivanovic and Terry who are better equipped to deal with nonsense passes like that anyway. I too expected much more of the players yesterday. And for some strange reason, Liverpool only seemed to register after the 2nd goal that “Hey! We’re in a final! Shouldn’t we play a little better than this?! ?” The team started far too slowly, and build-up play felt at times like revving an engine with the handbrake applied. But that was as much tactical as it was motivational. Carroll should have started – simple as that. I’ve seen many times that Andy’s presence takes defenders off Suarez, allowing the Uruguayan to work his magic, and that is enough to justify his inclusion. Add Andy’s endearing display of energy and blatant passion to get Liverpool back in the game as the cherry on top that would have won him many admirers (a pity, because despite that, I still think Liverpool need another #9 – one that at least produces the goals to match the effort). Perhaps Andy wasn’t needed against Norwich, but he was definitely needed against Chelsea, 55 minutes earlier than his eventual entry in the game, especially if Suarez was going to play so high up the pitch. So tactically, again – incorrect. The line-up was wrong. If you’re going to isolate a front man, start with Carroll. Don’t have 2 inexperienced midfielders trying to work the ball off Mikel, Lampard and Mata. Don’t leave sluggish defenders too far up the pitch, or at least keep a couple of defenders in deep lying positions to pick up the breaks. That inexperience and tactical ineptitude cost Liverpool. By the time Carroll’s entry increased the tempo, Chelsea was exactly where it wanted to be – re-enacting its performances against the Spanish giants, albeit less convincingly, defending a 2 goal lead. Of course, there will be arguments about the disallowed goal – but while I wish desperately that controversy had avoided rearing its head in this game (especially after the dodgy call for Chelsea’s 2nd goal in their semi-final), to be honest, it was immaterial. Chelsea was far and away the better team for the first 60 minutes. For Liverpool to only wake up by then and realise they were playing a cup final against a serious team in the last half an hour, was far too late to make any difference. So the question now finally comes – what next? How do Liverpool, players, staff and fans alike, move from this? That’s where I wonder if yesterday’s defeat does not hold a blessing in disguise, to impart some much needed urgency upon the club. I have to think that the emotions of a victory would have been quite dangerous, if not distracting from problems that must be solved. The pre-match discussions put into context the debates about the desired yardstick for Liverpool’s season. Is it league position? Is it trophies? Is it Champions League qualification? Is it all three? I maintain – Liverpool is about trophies – that’s why ultimately yesterday hurts a little more because it was a rich opportunity lost to continue the winning tradition. But I also believe that that shouldn’t be used to paper over the cracks. Had we won, would the club still consider how they were to drive a potentially significant summer? I for one, sincerely hope that the club leverages this disappointment to do exactly that – but it seemed the messages from the players and Dalglish differed slightly from the big picture. 2 trophies would have been a success, but that wouldn’t have defined the season as successful. Progressive, but not successful. Trophies are important, they always will be, but Liverpool has to be a club that challenges on ALL fronts. And if key financial issues linked to the stadium are foreseen to be likely to exist for a few years, then it means Liverpool have to learn from clubs like Newcastle and punch well above their weight class (that’s not to be disrespectful to Newcastle, but I’m sure most Geordies wouldn’t have expected Champions League qualification this season, and that is still a possibility). A victory would have played into the pre-match propaganda that the league campaign was merely extended periods of bad luck - a false perception that offers nothing but barriers to progress. Arsenal improved their squad dramatically after that 8-2 defeat to Manchester United. No trophies – but they’re close to achieving their targets, and impressively so. If the Red Devils end the season trophyless (which in itself in unheard of), there surely will be a response to improve the squad far beyond recalling old retired players. Wake up calls. Liverpool has to respond in kind, simple as that. Season 2011-12 has been a disappointment then. Yes, a trophy in the bag, but if Dalglish does keep his job, hopefully he recognises a few things. Liverpool’s squad still lacks depth in certain positions (defensive midfield, attacking midfield – for the latter, read Aquilani, hopefully). Serious competition is needed in goal, at left back, centre back, and central midfield. World class talent is need on the flanks and up front (only Suarez meets this requirement – no-one else). Dalglish also needs to recognise that tactically, the team needs to improve significantly. Not only when to apply certain lineups / tactics, as the FA Cup final illustrated, but to address the problems over the course of the season. 30+ shots against the woodwork isn’t unlucky. It’s poor finishing, poor training or ineffective chance-creation. Not to mention a shocker of a conversion rate, and far too few goals from set-pieces (and we get plenty of those!). Perhaps then, this is a defeat to offer important reflection. I doubt we would have reflected as we need to, had we won. The poor league campaign would have been dismissed by 2 trophies, but Liverpool’s squad quality and display of tactical ineptitude and application throughout the season, needs to be addressed. 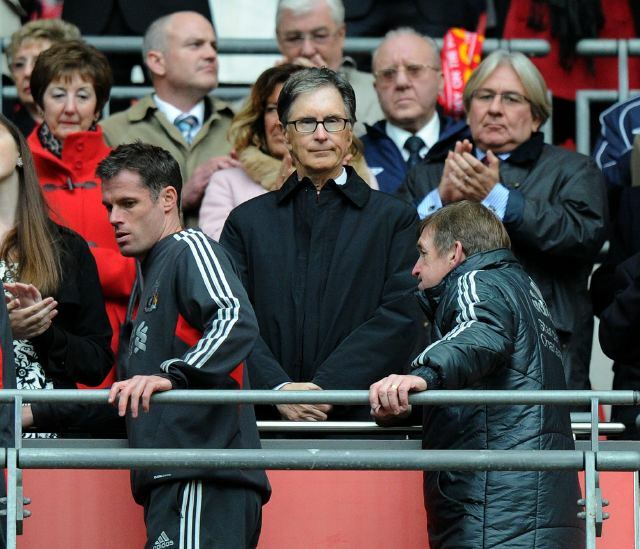 If John Henry is the kind of owner we want him to be, then the manager – Dalglish or otherwise – has some serious work to do.